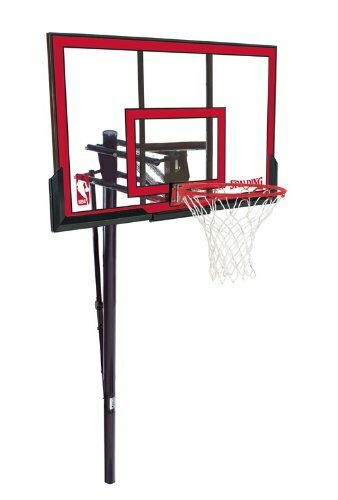 Spalding NBA In-Ground Basketball System - 48'' Polycarbonate Backboard by Spalding at Basket Express. MPN: 88354PR. Hurry! Limited time offer. Offer valid only while supplies last. 48" x 32" steel framed polycarbonate backboard. 2.5MM thick polycarbonate backboard for exceptional durability. Pro-GlideTM lift system adjust rim height from 7.5' to 10' in 6" increments. Three Piece, 3.5" round steel pole allows for maximum stability. Ground sleeve anchor system allows for easy installation. If you have any questions about this product by Spalding, contact us by completing and submitting the form below. If you are looking for a specif part number, please include it with your message.